Insurance contracts that do not come under the ambit of life insurance are called general insurance. General Insurance helps us protect ourselves and the things we value, such as our homes, our cars and our valuables, from the financial impact of risks, big and small – from fire, flood, storm and earthquake, to theft, car accidents, travel mishaps – and even from the costs of legal action against us. And we can choose the types of risks we wish to cover by choosing the right kind of policy with the features we need. A motor insurance policy is a mandatory policy issued by an insurance company as part of prevention of public liability to protect the general public from any accident that might take place on the road. The law mandates that every owner of a motor vehicle must have one motor insurance policy. A comprehensive motor insurance policy would include personal accident and liability only policy (third party insurance) in addition to own damage cover (damage to owner’s vehicle) in one policy. Some attractive benefits of motor insurance include roadside assistance, cashless servicing at a nation-wide network of workshops and garages, personal accident cover, towing assistance. Health care costs are increasing every year. Sedentary lifestyle and stress at work negatively affect the health and can result in a critical illness or medical emergency. Such a scenario is sure to adversely affect one financially, due to the massive outlay of money on medical expenditure. A health insurance policy is the only way to mitigate the financial risks, apart from leading a healthy lifestyle. Health insurance guarantees peace of mind in times of crisis and helps secure own health and that of one’s family. Health insurance covers the medical and surgical expenses of the insured individual due to hospitalization from an illness. Additional riders enhance the benefits and scope of the cover. International travel, whether for vacation or business, can turn into a nightmare if one experiences contingencies like loss of baggage, loss of passport, delay in flight, medical emergency etc. Such eventualities will surely take the fun away from traveling. Travel insurance, also referred to as visitor insurance, covers one against unseen medical and non-medical emergencies during overseas travel, ensuring a worry-free travel experience. 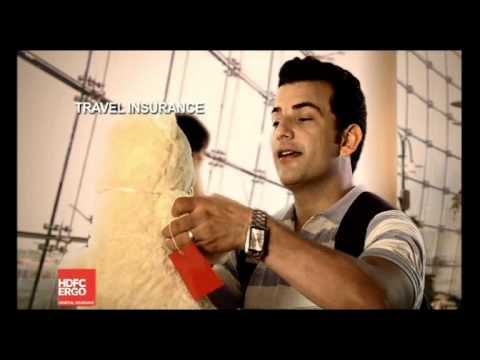 It protects the insured against misfortunes while travelling. Backed up by travel insurance, the whole experience is like no other. In addition to the above, some insurance companies offer special plans like a corporate travel policy or comprehensive policy for travel to special destinations like Asia and/or Europe. Home Sweet Home: This 3 words means comfortable place, relaxation, freedom, happiness, peace, family time etc. A house also entails a tremendous expenditure of money, emotions and time- a onetime investment in many of our lives. This home is made of walls and roof known as house. Property insurance is a policy that provides financial reimbursement to the owner or renter of a structure and its contents, in the event of damage or theft. Property insurance can include homeowners insurance, renters insurance, flood insurance and earthquake insurance. Business involves the import and export of goods, within national borders and across international borders. Movement of goods is fraught with risk of mishaps which can result in damage and/or destruction of shipments. This leads to substantial financial losses for both the importers as well as the exporters. The party responsible for insuring the goods is determined by the sales contract. Marine cargo insurance policy can be taken by buyers, sellers, import/export merchants, buying agents, contractors, banks etc. The policy usually covers the cargo, but can also be extended to cover the interest of a third party post transfer of ownership as determined by terms of sale. The hull of a ship or boat can be insured under marine hull insurance. Liability insurance is a policy that offers protection to businesses and individuals from risk that they may be held legally or sued for negligence, malpractice or injury. This insurance policy protects the insured from legal payouts and costs for which the policyholder is deemed to be responsible. However, contractual liabilities and intentional damage are usually not covered as part of this policy. PLI is mandatory for industries have an effect on third parties such as visitors, trespassers, etc. However, most companies procure PLI to avoid unnecessary risk. The premium related to PLI policies is quite high, but in the event of claim, the legal costs will usually outweigh the premium costs. Hence, having PLI is usually more prudent. This risk increases exponentially when these locations are shopping centres, theatres, stadiums, clubs etc and areas where sporting events are held and places that allow consumption of alcohol. In cases where the risk is extremely high, Insurance companies either refuse to insure these liabilities or charge a high premium. This is again not a compulsory insurance requirement in many countries, but it is highly important. This is procured by companies whose products are widely used such as chemicals, tobacco, medical products, food, recreational products and others. This type offers cover to liabilities that an employer may incur if an employee is injured during his/her employment due to the job. Sometimes, companies do not deem this as important but if faced with a claim, they might be driven to bankruptcy. This policy covers damages caused by the insured to another. The insured is considered as the first party, the insurance company is the second and the third is the injured or the person/company making the claims. Professional Liability Insurance (PLI), is also known as Professional Indemnity Insurance (PII) or as Errors & Omissions (E&O). This is a liability insurance cover that protects individuals from professional risks and related legal expenses. PII provides indemnity to all the professionals like Doctor, Chartered Accountant, Company secretary etc. It deals with the cases like third-party sustains injury, harm, death or damage to property due to professional service or advice provided by insured. This kind of cases are less in India then other countries. common cases arose due to negligence or malpractice by professional and sued them in court. According to National Crime Records Bureau (NCRB), total 4, 00,517 people died of unfortunate deaths in 2013, a rise of 14% over the previous year. According to the World Health Organization (WHO), the death rate per 1, 00,000 of the population for road traffic accident was 18.9 in 2013. 1214 road accidents occur every day in India. Minor accidents can indispose you temporarily but Major ones can severely impact your life and well-being. A sound insurance plan to protect you from economic repercussions of having a mishap has become a necessity. The value of the human life is immeasurable, but with a view to providing some relief to the injured person or a dependent, insurance companies have devised this insurance policy. It refers to an insurance which offers compensation in the event of demise, bodily hurts, impairment or mutilation resulting from an event such as a violent, hazardous, visible and external means. The types of events that are included in such insurance are rail, road, and air injury because of collision or fall, burn injury, drowning etc. The policy guards your dependents (parents or family) from any economic repercussions if the unfortunate comes to pass. A person should purchase the policy that covers or provides reimbursements for all eventualities from short-term impairment to untimely demise, and safeguard the family’s future. Besides, online renewal of these plans is just a few clicks away. Fire Insurance: Residential building, household goods & personal effects as per fire policy also include Earthquake risk. All Risks: Loss or damage to jewellery , Valuables etc due to accident or misfortune. Personal Computer & Laptop: All risks subject to specified exclusions. Pedal Cycle: Loss by Fire & allied perils Housebreaking / Theft, Accidental external means. Risk of Terrorism can be covered at extra premium. Impact damage by rail/road vehicle not belonging to the insured. Covers loss of money in transit, loss of money/valuables whilst contained in a locked safe, loss of money contained in cashier's till and/or counter by burglary/housebreaking. Covers loss of or damage to fixed plate glass in insured's shop by accidental means. Covers insured and spouse and/or his children, named in the schedule and aged between 5&70 years, against bodily injury caused solely and directly by accident and resulting in death or permanent total or partial disablement or temporary total disablement within 12 calendar months of such injury. Covers loss of profit due to interruption of business consequent upon loss or damage sustained by property insured under Section I of the policy due to insured perils. The risk of fire is among the top concerns for homeowners. Fire insurance is included as standard as part of both buildings and home contents policies from Finanza. ₹15,00,000 with home contents insurance. Make sure you have at least one smoke alarm on every level of your home, and test the batteries once a week. Never remove the batteries without replacing them. Check your electrical equipment regularly for exposed wiring, cracks or other damage, and get faults repaired quickly. Use only the correct gauge of fuse in your plugs and fuse box. Don't overload your power supply – try to keep not more than one plug per socket. If faced with hot oil on fire, for example in a chip-pan, never throw water onto the flames – starve the fire of oxygen by putting the lid on the pan, or covering it with a thick damp cloth. Keep matches and saucepans on the hob out of reach of children. Before you go to bed, shut doors around your house where possible. This will contain fires for longer if one breaks out when you are asleep. The law defines robbery as the act of taking or attempting to take something that has value from someone by using intimidation, force or threats. For the law to recognize an act as a robbery, a victim must be present at the scene of the crime. Bank hold-ups are typical examples of robbery. On the other hand, burglary is the unlawful entry to a structure for committing theft or another felony. It is worth noting that a victim does not need to be present at the scene of a crime for a burglary to take place. Before paying any claims, insurance companies require documented proof of ownership of the existence of the goods prior to the burglary. This enables them to avoid losses arising from individuals fabricating the ownership of goods for monetary gain. Agriculture plays a vital role in India’s economy. Over 58 per cent of the rural households depend on agriculture as their principal means of livelihood. Agriculture, along with fisheries and forestry, is one of the largest contributors to the Gross Domestic Product (GDP). Agricultural Insurance Company (AIC) aims to provide insurance coverage and financial support to the farmers in the failure of any of the notified crop as a result of natural calamities, pests and diseases to restore their creditworthiness for the ensuing season; to encourage the farmers to adopt progressive farming practices, high value in-puts and higher technology; to help stabilize farm incomes, particularly in disaster years. The plan provides comprehensive risk insurance for yield losses due to natural fire and lightning, storms, hailstorms, cyclone, typhoon, tempest, hurricane, tornado flood, inundation, landslide, drought, dry spells, pests/diseases, etc. Commercial insurance encompasses solutions for all sectors of the industry arising out of business operations. Insurance solutions for automotive, aviation, construction, chemicals, food and beverages, manufacturing, oil and gases, pharmaceuticals, power, technology, telecom, textiles, transport and logistics sectors. It covers small and medium scale enterprises, large corporations as well as multinational companies.